As I have mentioned previously, the rains have caused flooding. The flooding has been caused by a neighbor up the hill grading dirt to build a house and that has caused the water to divert into previously unused areas. Formerly, the flooding would only come up about 6 inches at the worst. Now it is about 3 times the height. The water flow has filled in a low area that was only a damp area. 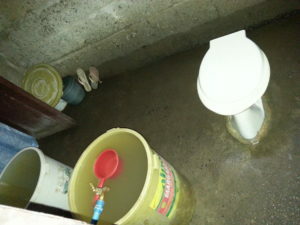 The flooding has caused the well to fill with the mix of waste water and the runoff from up above as well as the knee deep flooding in the children’s home. I don’t know if there is anything that they local barangay captain can do to assist with resolving the problem. The blue floor is not tile, but if you look in the lower right area, you will see wrinkles. It is a type of oil cloth. They can take it up and clean it and under it when it floods. They bleach and scrub but it starts all over again with the next rain. One of the considerations is to extend the height of the wall above the flooding level. Overall, there is no easy solution. We are trying to investigate i all the options. I am still having problems with the internet, this has taken 3 days to go out. I will post as able. Thank you for your patience.